Bonnie Cafferky Carter founded the CAFFERKY | RUSSO Law with a focus on legal solutions for business, probate and estate planning matters in Oregon and California. Her vision is to provide a wide range of legal services while building upon the reputation she enjoyed as a solo practitioner. 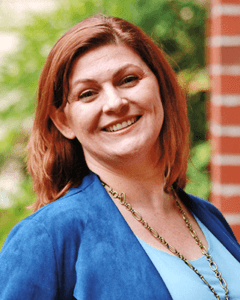 Passionate about solving and preventing problems, Bonnie is known for talking clients out of expensive or unnecessary actions in lieu of a solution better tailored to their situation. Prevention and education is key, but attorney Carter doesn’t shy away from litigation when it is necessary — handling matters in state and federal courts in both Oregon and California. Beginning in fall of 2016, Bonnie has served on the faculty of Linfield College teaching business law. Lecturing in an undergraduate business program is a natural extension of Bonnie’s private practice — as she is a strong believer that everyone benefits from learning about the law. She has previously taught courses on Probate Procedure and LSAT Preparedness, and presented at programs for lawyers on topics including contract lawyering, solo practice, and for the annual Oregon State Bar Learning the Ropes panel for new lawyers. A regular speaker at legal and community events, she has also given less formal presentations on topics ranging from estate planning with charities, trusts vs. wills, and when to call a lawyer. An active member of the legal community, Bonnie is the current President for the Clackamas County chapter of Oregon Women Lawyers for 2017. She has also recently served on the Oregon Women Lawyers Board of Directors (the second largest volunteer bar in the state), and was selected as a Fellow for the 2008 Oregon State Bar Leadership College. She also enjoyed the opportunity to co-grade the summer bar exam with the Board of Bar Examiners (2010, 2011), including co-authoring an exam question on Corporations. Bonnie attended two top-tier law schools; graduating from Boston University School of Law while attending UCLA for her final year. She hurried back home to Oregon as quickly as she could, taking the California bar exam in 2003 and the Oregon bar exam in 2004. Bonnie continues to mentor and speak, both formally and informally. She lives in West Linn with her three sons. One item on her to-do list is to finish her M.B.A.
Disclaimer: Attorneys of the Cafferky and Russo Law Group are licensed to practice law in Oregon and California. The information provided on this website is offered for informational purposes only. It is not offered as legal advice. Cafferky and Russo Law Group does not seek to represent you based upon your visit to or review of this website. An attorney-client relationship does not exist with Cafferky and Russo Law Group until your case has been evaluated and a written representation agreement has been entered into. This website may be considered advertising under the rules of Oregon. You should not make legal hiring decisions based upon brochures, advertising, or other promotional materials. The content of any Internet email sent to CAFFERKY | RUSSO Law or to any of its lawyers the email addresses set forth in this website will not create an attorney-client relationship and will not be treated as confidential. Links within this website may lead to other sites. Such links provide further information for the visitor’s convenience. CAFFERKY | RUSSO Law does not necessarily sponsor, endorse, or otherwise approve of such linked materials and does not control or guarantee the accuracy, relevance, timeliness, or completeness of the information contained in such links.